Pledge to good health this autumn and experience the magic of the ancient science of yoga. Let the pranic energy heal your mind, body and soul. Visit The Yoga Institute, Santacruz (E), this November for Yoga Health Camps designed to prevent, manage and cure various health conditions. Yoga touches all spheres of life - physical, mental and spiritual. It is very systematic and rational. When you practice yoga, you are not asked to follow anything blindly. You are helped to understand the rationale behind all the yogic techniques and procedures. And these techniques in turn help you evolve into a better individual – physically healthier and mentally stronger. With regular practice and a strong belief anyone who practices the art of yoga will see results for sure. There is a magnitude of advantages of practicing yoga. It has a very holistic approach and hence it helps in making every section and every phase of live worth living. We have all attended workshops and seminars that tell us how important it is to have a pleasant personality, good body language, strong interpersonal skills and to be confident. Through asanas (yoga poses), pranayamas (breathing techniques), mudras & kriyas (other yogic practices) one can achieve all this soft skills with a lot of ease. And the best part is that while doing so you are also simultaneously taking steps towards keeping yourself fit and healthy. Yoga also helps your develop the right perspective towards life. Yoga helps you LIVE your life. It teaches you how to rise above sufferings and trains you to manage your life well. The Yoga Institute, Santacruz (E), which is a 95-year-old symbol of wellness and also the oldest organized yoga training centre in the world, announces its schedule for yoga health camps to be conducted in November 2014. The institute will conduct 7 health camps this month, each one of those to address a specific health condition – cardiac care, hypertension, respiratory care, orthopaedic care, stress management, weight management and diabetes care. The workshops will begin with a talk the subject by Smt. Hansaji Jayadeva (the director of the institute) and will be followed by interactive sessions with yoga consultants, nutritionists and established medical experts in the relevant field. 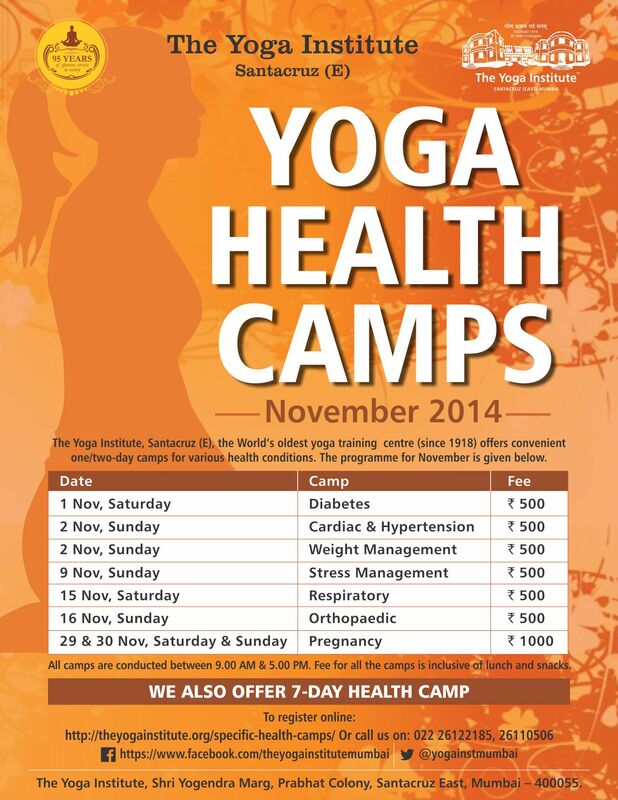 All the health camps are priced between Rs. 500 and Rs.1000, inclusive of lunch and snacks. The camps were started with a vision to spread yoga awareness and reach out to people to help them prevent control and manage various ailments.